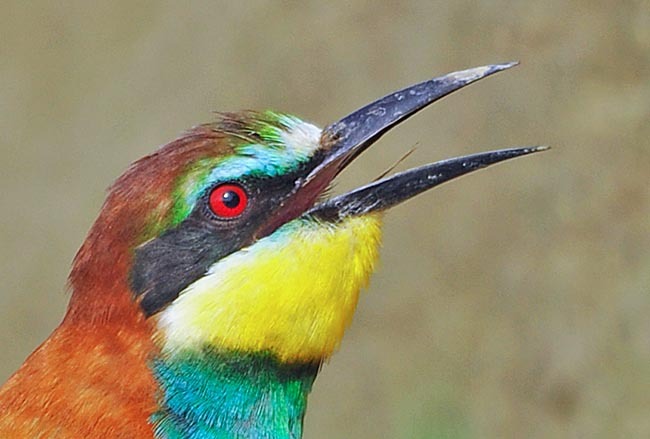 The European bee-eater (Merops apiaster Linnaeus, 1758) belongs to the order of the Coraciformes and to the family of the Meropidae and is one of the most colourful birds of the European continent besides being the only present species of this family. A real rainbow, vivacious colours, typical of the tropical world, to which belong practically all the 31 species assigned to this genus and in fact this bird is a summer visitor of our sunny Mediterranean areas where it gets to cheer our summers, with its bright colours. 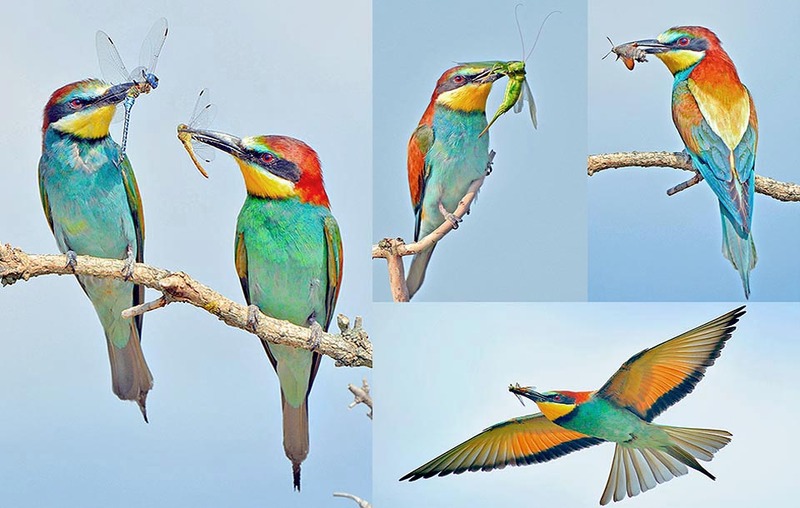 It is often said that the best way for taking a census of the entomological fauna of a certain place, is to observe a European bee-eater on its preferred perch where it consumes its preys instead of going around in the fields looking for insects. This bird is an infallible hunter of flying invertebrates crossing its range of action, whatever size or dangerousness they may have and regardless of the flying capacities they have. 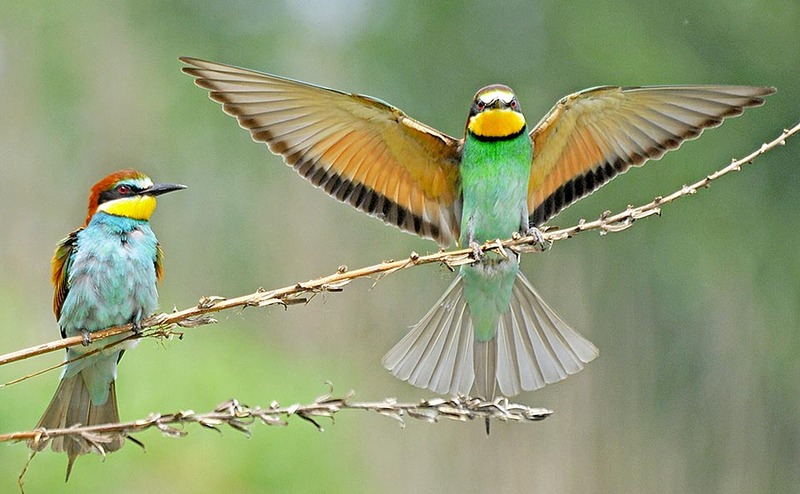 The European bee-eater is able to seize about everything with extreme ease. Bees, hornets and wasps do not scare it, nor do escape the very fast blowflies, the massive and armoured coleopterans, the elusive dragonflies and the coloured butterflies. A unique flying elegance, with pirouettes and very rapid glides, wheelies and breathtaking descents and finally the precisely accurate catching. Then, immediately, the return to its preferred roost, a dried branch, an electric cable, a trunk on the ground or whatever support from which it can dominate the surrounding area. An air show not to be missed and a lesson of flying mastery. The etymology of the scientific name accurately reflects the name of the main prey of this bird. The genus Merops comes from the homonymous Greek term that identified the European bee-eater, even if the name has been borrowed from the old Hellenic mythology that linked it to Merops, the king of an old kingdom and mentor of the more famous Priam, king of Troy, who committed suicide for love when his wife passed away falling accidentally from a cliff. The species apiaster comes from the Latin “apiastra”, always with the same meaning of eater of bees. Other common European names given to this bird are: Bienenfresser, in German; Bee-eater, in English; Abejaruco, in Spanish; Guêpier d’Europe, in French; Abelharuco, in Portuguese, Gruccione, in Italian and an unmentionable Yoaroppahachikui in Japanese. In the Italian dialects stand up the term gruccione from grucce = crutches, due to the two elongated caudal appendices and other ones, somewhat imaginative, such as tordo marin, vespier, rondano, dardano, abiadoru, grottaione and a quite simple but exhaustive “bird eating the bees”. 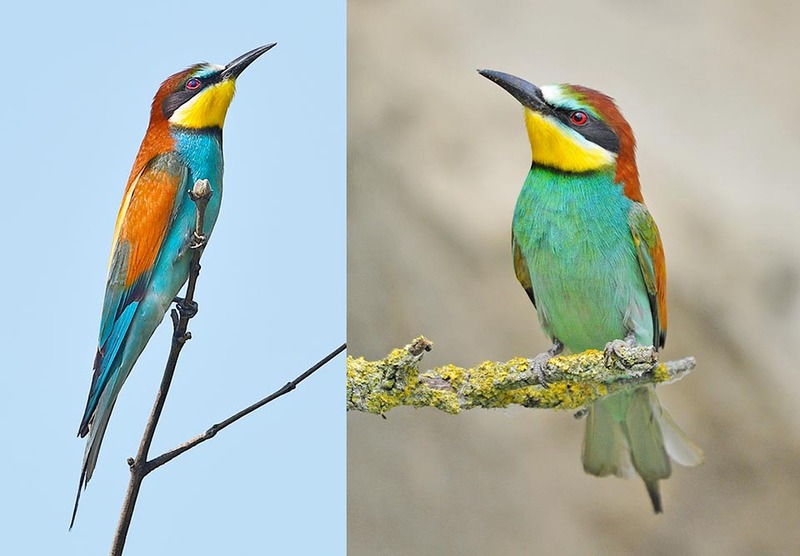 The European bee-eater occupies the Mediterranean part of Europe, even if are present some rare colonies in the south of the Scandinavian Peninsula, on the Baltic Sea coasts and in Holland. It is well diffused in the eastern European part particularly in the Balkan Peninsula. In England, it has done, during the last 50 years, several attempts of nesting, but there are not yet stable and well defined colonies. It occupies also some areas of Central Asia and the African coasts of the Mediterranean Sea of Morocco, Algeria and Tunisia. There is a stable population in South Africa and in Namibia. All other populations are highly migratory and leave the nidification territories already in August and get back to the reproduction sites in the following May. The European populations and most of the west-Asian ones have the winter quarters in sub-Saharan Africa whilst some central Asian strains winter in the Indian subcontinent. 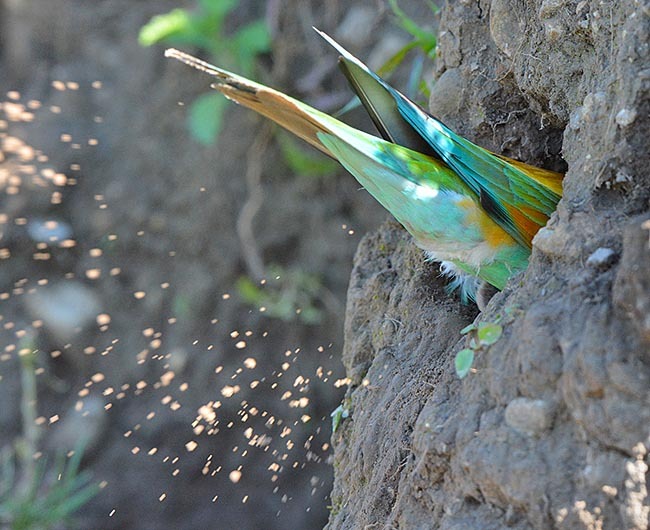 The European bee-eater choses well sunny and dry areas, with a very high daily insolation period. As a matter of fact, it does not suffer from high temperatures nor of the unavailability of water for the vital needs. In Italy it is fairly diffused in particular in the northern part where it seems having found one of its best natural habitats. It is constantly expanding in the Po Valley and nowadays there is no river bank, abandoned quarry or even road embankments where a colony is not present. Conversely, it is somewhate rare in Sicily. It is a bird that does not go unnoticed even by the layman due to its splendid livery but also due to the penetrating cry it continuously emits during its aerial acrobatics and even more when migrating. A penetrating and unmistakable krikuik krikuik, emitted at remarkable heights, so much to be heard without being seen. The European bee-eater loves open bushy areas, with sparse trees, vast woods clearings, wastelands, edges of roads but also places that always have natural supports, such as not particularly high poles and electrical cables, dried trees, wire fences or barbed wires, from where it can dominate the surrounding area. They are quite often linked to the presence of rivers and water streams but only for necessities related to the nidification sites and to the typical abundance of the insects of such places. In fact, the steep banks of the water streams, formed by dried mud and sand and continuously eroded and deformed by the seasonal floodings, are their ideal place of nidification. 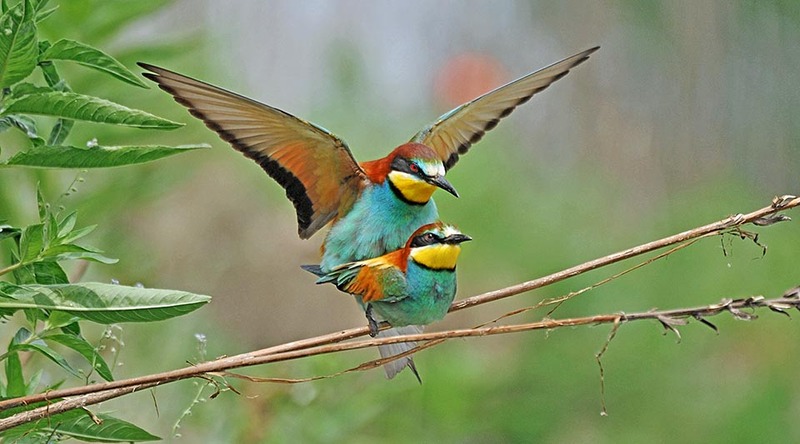 The European bee-eater is a very sociable bird and spends every moment of its life in communities at times very numerous. It migrates in dense flocks, hibernates in huge groups and nidifies in colonies. To observe an isolated specimen is a rather rare occurrence. It is a typical bird of plain and hilly zones and rarely in Europe goes up to more than 1000 metres of altitude. Purely insectivorous, is a great hunter able to catch several hundreds of insects every day without causing any damage to the human activities. The melliphagous bees stand among their preferred insects but this does not cause evident problems to the hives close to the colonies, as the number of catches stands into the normal context of the bees natural causes of death. 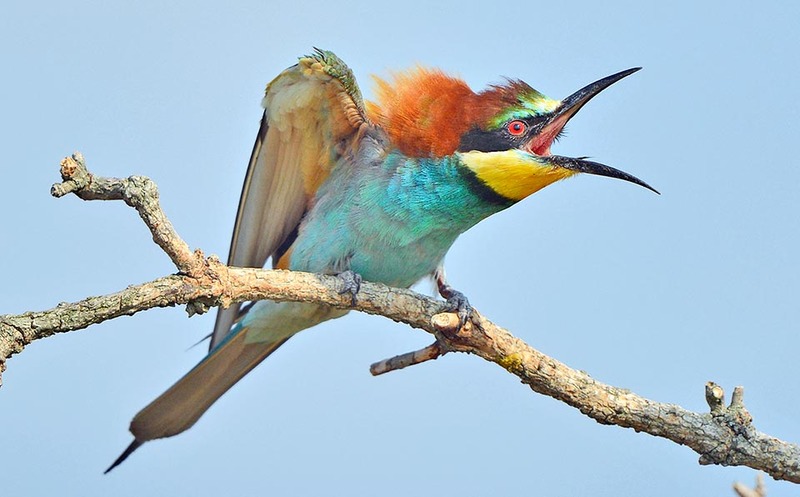 Once seized the prey and back to the preferred perch, the European bee-eater is able to slam with great skill the body of the hymenopteran against the bearing support, firmly but in the mean time gently, succeeding in removing the sting and the poisonous glandular part of the abdomen. The prey is then swallowed after having been tossed in the air with a very fast movement and taken back with the same sense of timing. 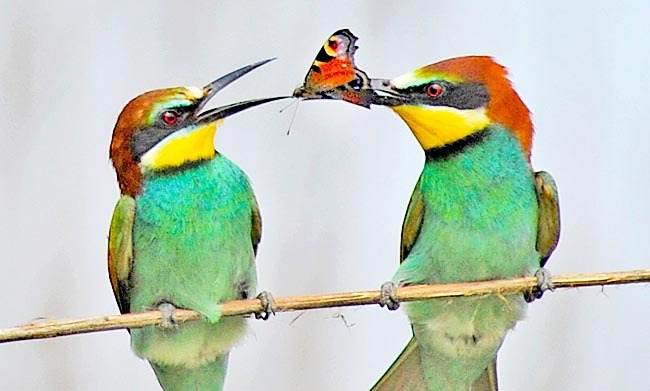 The European bee-eater regularly regurgitates fairly voluminous droppings that contain the elytra and the non-digestible keratinous parts of the eaten insects. These droppings are real jewels as they glisten of multi-coloured small pieces of elytra, that crushed by the digestion, amply cover all the surface. 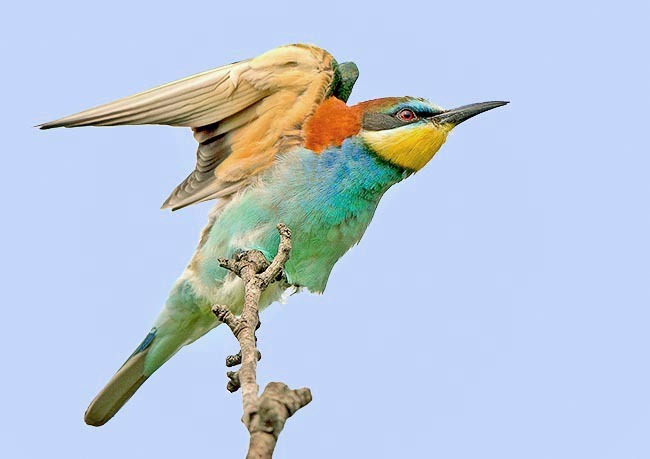 The European bee-eater is a real rainbow of colours, so much that it would be easier to list the missing colours than those present on its livery. The rump and the head are of bright brown colour, with golden reflections and outlined, along the wing, by yellowe belts. The primary coverts are brown too with bright light blue remiges. The face is marked by two wide black belts that, like a face mask, starting from the eye cross the line of the eyes. The front is marked by a white belt that becomes light blue on the sides close to the eyes. The throat is straw yellow stopped by a black collar that limits the totally bright light blue chest and that, depending on the age of the subject, may even tend to green. The tail is greenish light blue with the two central feathers elongating for some cm and creating a typical swallow-like tail. Long and black beak, pointed and slightly curved on the tip. The legs are blackish too and the eyes are of a vivid blood red colour, exceptionally bright when enlightened. The underwing is reddish hazel for the part referred to the lower coverts that neatly detaches from the bluish remiges. A real palette of colours. There is no evident sexual dimorphism if not for very small particulars at times imperceptible whilst the young distinguish due to the absence of the caudal appendices, that will grow up from the second or third year and due to the duller colours and usually tending to greenish. 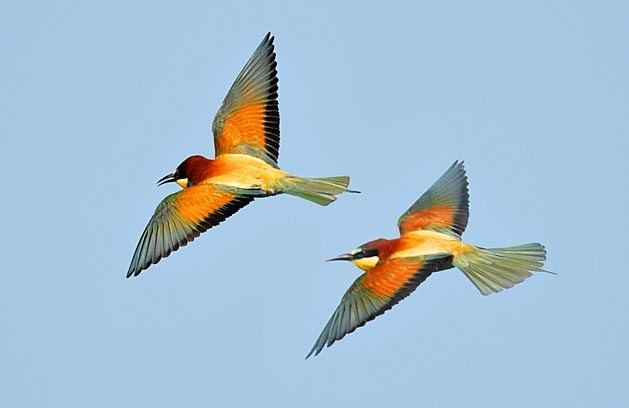 The European bee-eater is a medium-sized bird with a very slender body and pointed wings. It measures about 30 cm of length, a weight of 70 g and a wingspan of almost 40 cm. So beautiful is the colour of its livery, so is the need to hide it from the attack of the predators during the nidification. It is not for sure the way of building the nest that has conditioned the maintaining of the colour by this species or it may be an evolution conceptually opposite but we cannot ignore the concept that a specimen of such colours exposed in the open air during the brooding, should be an easy sighting for possible predators. 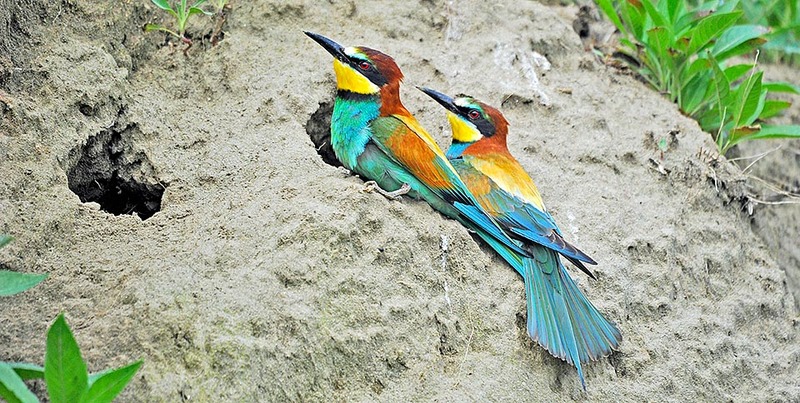 The European bee-eater builds a rather elaborate and not easy to build a hypogeus nest. It digs a horizontal tunnel, on the walls of steep banks or in embankments having a height difference with the ground, even 3 m long but in some cases even more and on the bottom creates a small chamber where to spawn. It makes it also directly on completely flat lands, digging an initially slightly descending tunnel that then straightens creating a tunnel goind parallel to the ground all over its length. This type of nidification may create remarkable hygienic and breathing problems to these birds and their progeny as, keeping on the bottom for a long time in a poorly oxygenated habitat, immersed in the ammonia stench of the leftovers and of the excrements, they find themselves living in an absolutely unhealthy condition. However, it seems that this bird, like other birds nidifying in deep tunnels such as the Common kingfisher (Alcedo atthis), has developped in the blood a high contents of haemoglobin that allows the maximum absorption of the little oxygen present. The excavation is done by both sexes with a frantic work lasting some days. During these operations, from the outside of the hole we see coming out sprayed sand splashes that create small dollops that are later on scraped back again to creat room for other material. A mad work of beak, nails and paws that keeps busy the colony for several time. The couple is stable for the nidification season even if cases of polygamy have been reported. 5 to 8 very white and glossy eggs of a quite spheric shape are laid that are brooded by both sexes for about 20 days. The chicks stay in the nest for 4 weeks more and after the first take off are not able to indipendently procure their food at once, therefore they are parents dependant for another long time during which they learn the mastery of the hunting flight. It has often been noted in the familiar groups, the presence of helpers that assist the parents in caring and nourishing the progeny. It is thought that they belong to the previous brood or even specimens, always not nidifiying, of other families of the colony. 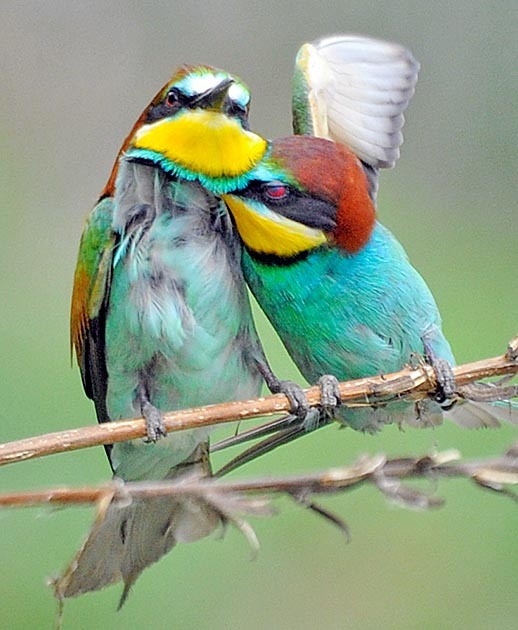 The Eurpean bee-eater has not many enemies, except snakes and mice that can enter the dens to predate the brood. 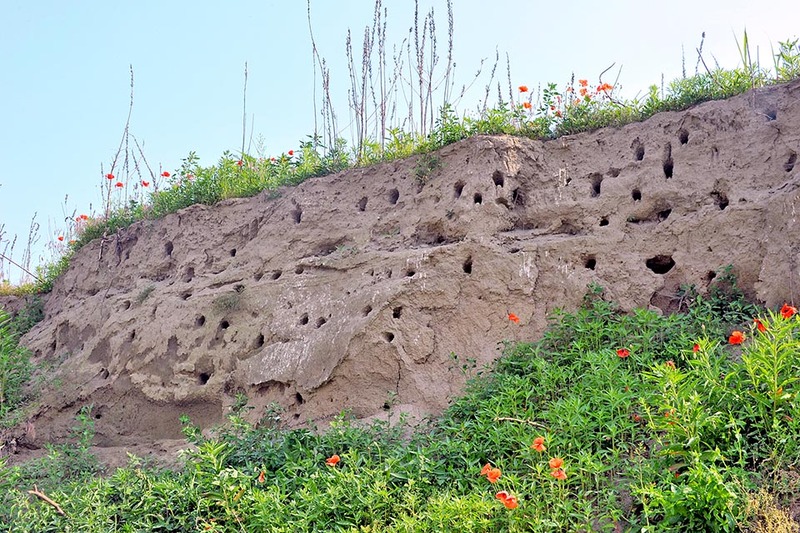 Much heavier, with damages to the whole colony, can be the sudden collapse of the wall where the nests are dug or the sudden flood of a river with failure of the shore ridges. It is a remarkably expanding bird towards northernmost areals and the species is not considered as endangered.